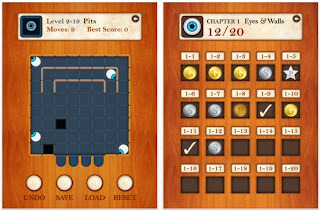 Announcing The Best of The Best Puzzle Apps of 2012. Also check out the list of Best Puzzle Apps of 2012 which I published Dec 30. They are also worthy of your time. 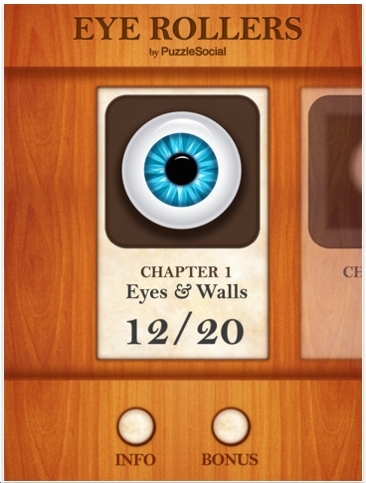 These puzzle apps are actually the runner-ups to the Very Best Puzzle apps - published 12/31/12. 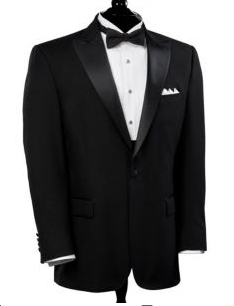 The tuxedo image represents the formality and seriousness of this significant event. 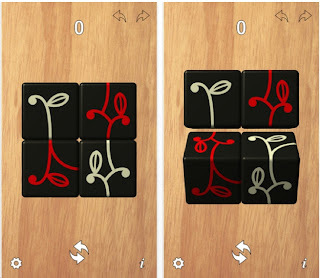 Recently Paul Lapstun, from Australia, contacted me about his new puzzle app Senkai. Senkai is a very challenging puzzle. The object is to roll/shift pairs of cubes - either the top set, bottom set, right set or left set - until the white pieces form a circle. Or the red pieces form a circle. Yowsa, this is tough! According to Paul Lapstun, the brain behind Senkai, there are 165,888 possible configurations. I have not solved this. Paul tells me that they're working on an easier version as in introduction. 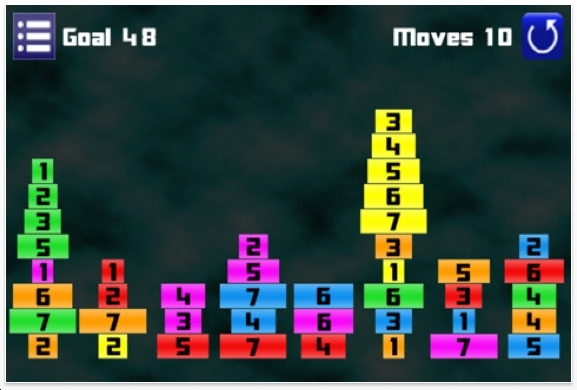 Six Stax is a game that is similar to Tower of Hanoi. The object is to move the discs, one at a time, so that only a smaller disc can go on a larger disc of the same color and get all the towers organized properly. 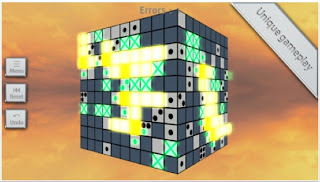 We've seen this exact same puzzle app from another developer. Or maybe it's the same developer just using a different name. 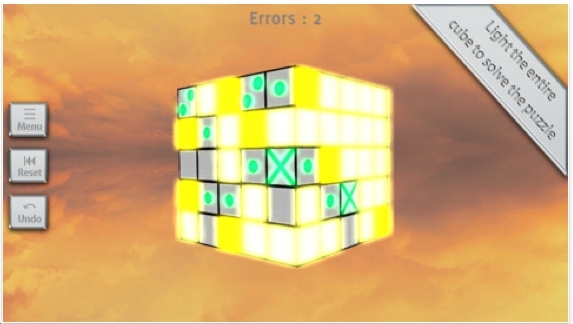 Besides solving the puzzles, can you solve them using fewer moves than other people? 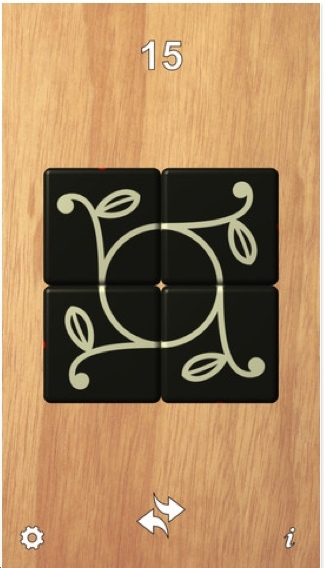 Karyo is a surprisingly fun logical puzzle. 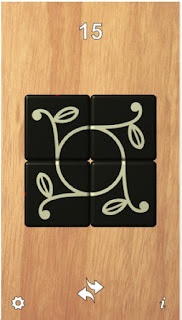 The object is to clear the board of the tiles by tapping in the space between 2 very close, but not touching, tiles. When that happens, one tile will disappear and the other will move to the space tapped. There are 50 free levels. I've solved them all. I like this puzzle game app. Look for my list of Best Puzzle Apps of 2012 at the end of the month. Vaccine Case is a brilliant, original, FUN, puzzle by Wataru Nakano. The object is to kill the viruses with the matching gases by opening and closing doors. When the virus is killed, the gas will disappear from that room Therefore, you may need to save some gas for down the road. Previously, I reviewed the Lite version which has 12 levels. The paid version is $2.99 with 100 levels. Well worth the money. Right now I've solved about 85 of the levels. Brilliant and fun. 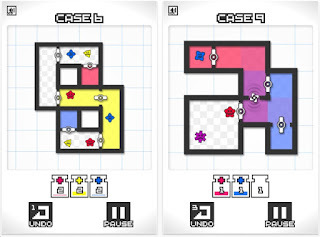 Easily one of the Best Puzzle App Games of 2012. 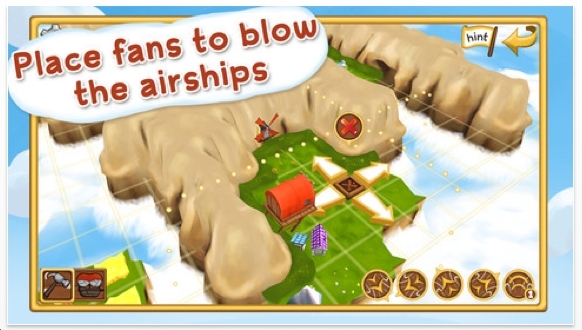 Kings Can Fly is a puzzle game app where the object is to place fans on the grid so that when the ships leave the red barn, they will turn in the correct directions to get to their destination. We've seen numerous games like this. Instead of windmills, the user must place arrows on the grid. Kings Can Fly has a nice 3D touch that kids would like. The graphics are very 3D and will appeal to kids. A more sophisticated version of this is called Arrow Command, which I reviewed in January, I think. 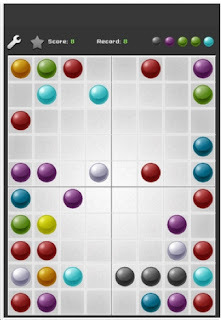 Oball is a point scoring puzzle app from Vlifect. Their webpage is down or defunct. However, the puzzle game is quite good. The object is to get 4 balls of the same color into a cluster of 4 or more. When that happens, they disappear and you score points. 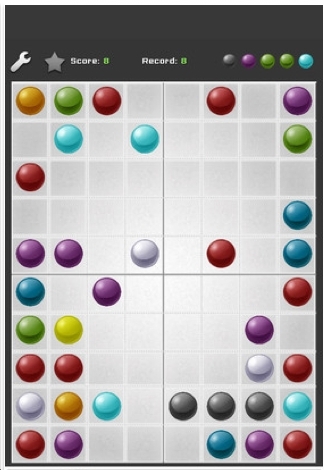 Gameplay: tap on 2 balls and if they can trade places via an open path (no diagonals), they will swap. You score more points by getting a cluster of 5 or 6. But that's not necessarily an optimal strategy. Right now, my score is about 16,000. That's from playing 30 minutes a day for about two weeks. Oball is a darn good puzzle app game. However, it's a bit too easy. I've made mistakes that I thought spelled my doom. But I keep getting out of the jams and am afraid this one game of mine might go on for weeks or months. A similar game that's much harder: BeeCells Lite. Luma Link is a series of 300 puzzles where the object is to slide the tiles around until the silver ball can go into the red hole. The silver ball can travel to an adjacent tile. Tiles can move horizontally/vertically ONLY IF the selected tile has a matching colored tab with another tile on that same row/column. You'll notice that some tiles have tabs only at 12 o'clock & 6 o'clock: they can only move up and down, never side to side. I have done all the medium & hard levels. The presentation is slick. This is a free puzzle game app. It comes with video ads that take over the screen after solving 4 or 5 levels. Pay a buck to remove them and get an additional 300 levels. 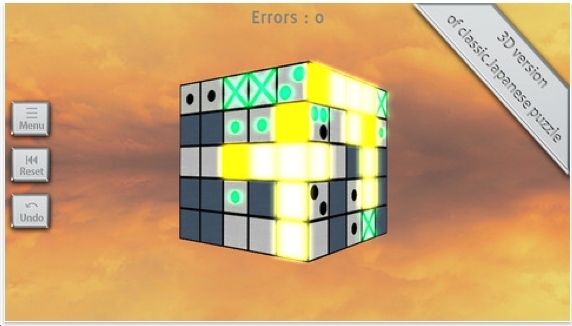 There are also free daily puzzles. 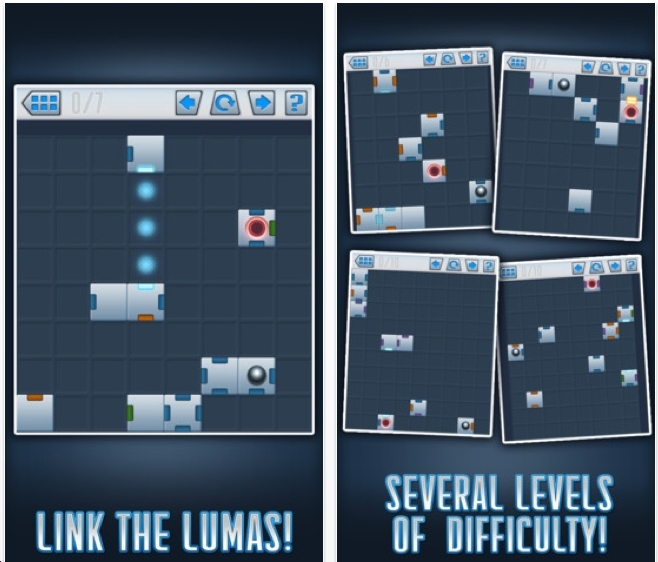 I'd like to see Luma Link as a puzzle that would allow players to create their own levels. Because I'm curious as to how hard they could be. 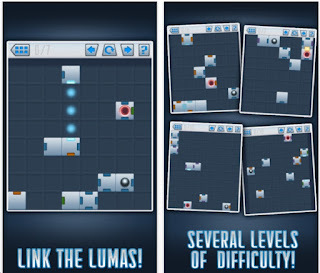 Bottom Line: Luma Link is mildly challenging, fun and definitely worth your time. On December 30th, I will publish a list of the Best Puzzle Apps of 2012. 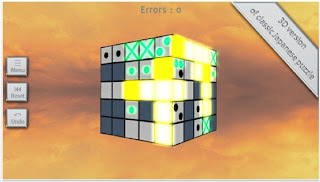 On December 31st, I will publish a list of the Very Best Puzzle Apps of 2012. What's the difference? 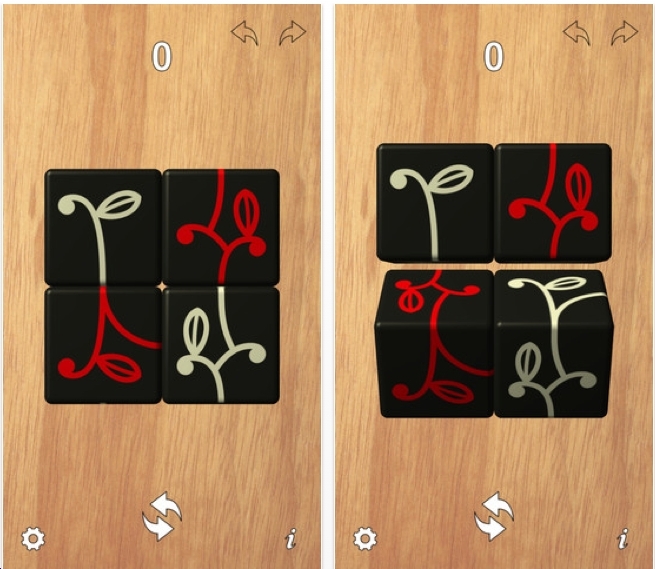 The Very Best Puzzle Apps: I played them a lot more than the others. Also, this blog is just about to get its 250,000th hit. If you're it, take a screen shot, send it to me and get a prize. One more thing: this blog currently gets about 600 hits/day. But there are only 116 followers. If you sign up as a follower, you'll make my day. The first image describes the rules, maybe a bit awkwardly. We've seen many topology type puzzles like this before. Start at A, end at B. Go over each of the other circles - some of the circles must be landed on 3 or 4 times. Look closely at the white dots around the A. They indicate where you may land next. Netbound is smart, fun and well done. I have not solved all the levels yet. Line's Life Pro is a concept similar to Lunar Lockout, Pike's Peak and Fling. The object is to align the circles in pairs of matching colors - vertically or horizontally - then make them disappear by having 1 of them crash into the other. 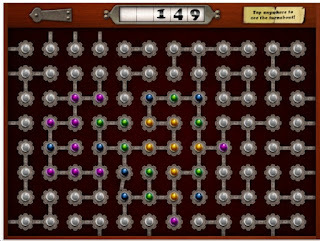 There are 162 levels, and I was originally stuck on level 7! You're wondering: Tom, does Line's Life make it onto the list of Best Puzzle Apps of 2012? Probably. Check back at the end of December. 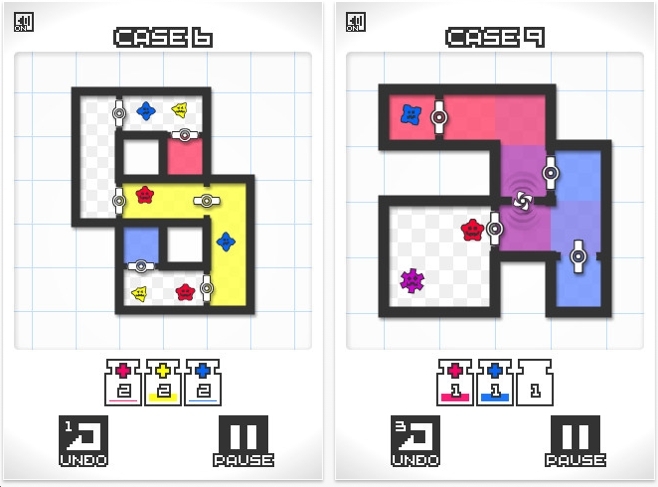 Wataru Nakano from Japan has created a brilliant new puzzle concept called Vaccine Case. The program does not offer written directions, so pay attention. It is not easy to explain: the object is to kill the blue virus with the blue gas by opening and closing gates. If a room holds blue gas and you open the door, that gas will fill up the remaining area and will disappear with the dead virus. You will need to save some blue gas in another room. Vaccine Case Lite has 12 levels - the last few are hard. I have solved them all. 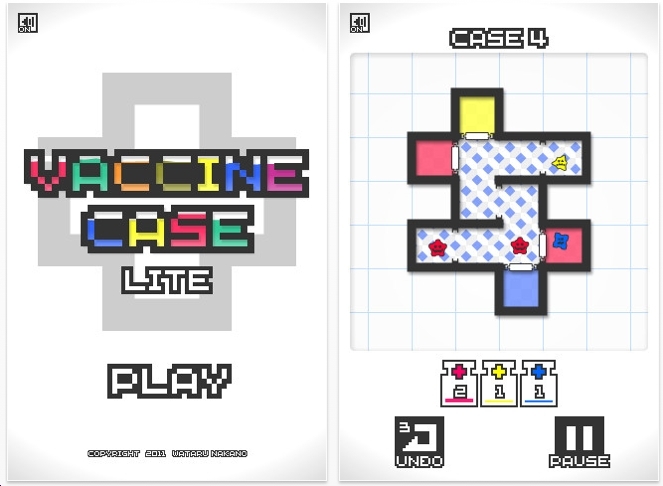 Vaccine Case Lite easily moves onto the list of Best Puzzle Apps of 2012. Next week I will report on the full version which has 100 levels. 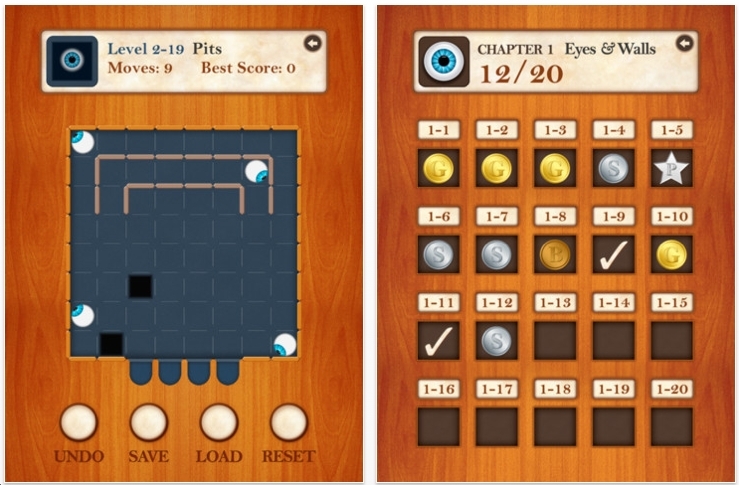 Are you designing a puzzle game app? 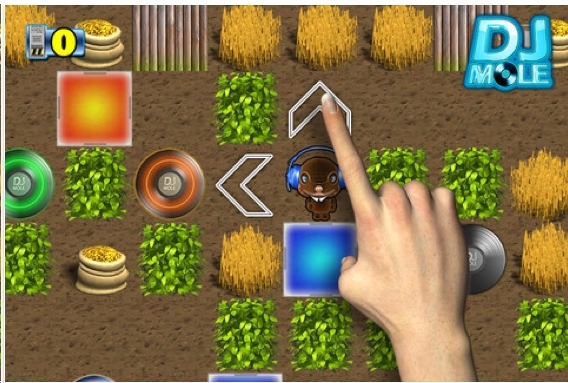 Click here if you're in the process of developing a puzzle game app. It is a quick reference guide. Puzzle App Developers: what worked for you when trying to promote your puzzle game? DJ Mole is a sokoban type puzzle. The object is to get the DJ Mole to traverse the grid and pick up old albums. 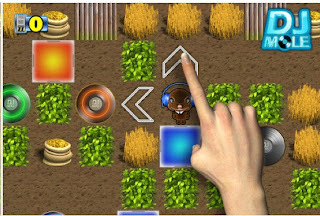 If DJ Mole picks up a blue album, then his headphones turn blue and that allows him to push blue obstacles out of his way. One drawback is that you can't see the entire grid all at once. But that adds another element of complexity. There are 15 free levels, and I've done them all. Without a doubt, this concept is not entirely original. But the implementation of a Mole who is a DJ - brilliant! 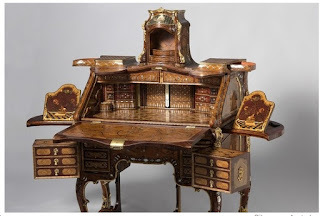 The Wall Street Journal has an article about an exhibit at the MET in NYC that displays puzzle desks. I have not seen the exhibit - yet. 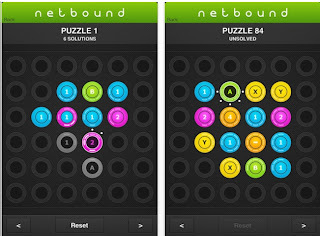 Turnabout is a point scoring puzzle app. The object is to tap on one of the gears to turn it. It will then turn other gears until it no longer connects with another gear. There's not much here in terms of play/thinking. It's very similar, if not identical, to another puzzle game called Fun, which I reviewed ages ago. 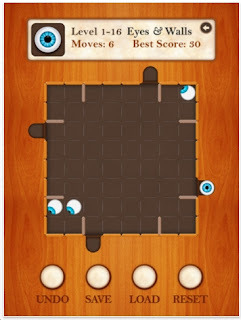 Eye Rollers comes from http://puzzlesocial.com/ It is similar to a tilt maze puzzle. 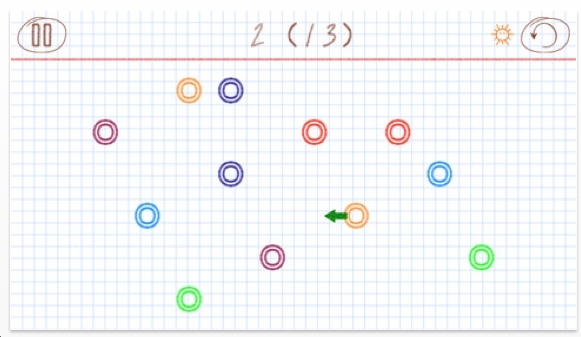 (A true tilt maze: all the balls would roll simultaneously in the same direction.) Roll the balls one at a time until they hit an obstacle or go into the side pockets. There are 20 free levels. I have solved them all, but not by using the minimum number of moves. Therefore, I will have to pay to play the other levels. 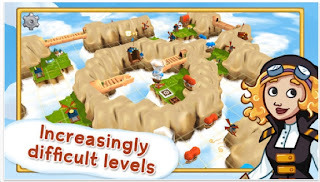 Of the 20 free levels: some of them are tough and clevely designed. They don't include the Red Eyes that destroy walls. I have not play-tested those levels yet. 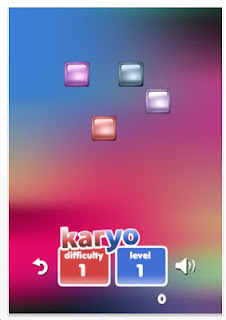 Guillaume Ortega contacted me recently from France about his new puzzle app: Akari 3D. Akari is one of my favorite pencil puzzles from Nikoli press in Japan. Describing the puzzle game is not easy. I would recommend that you first download and play Akari Free. Black squares have numbers, or dots. That number indicates how many light beams to place on each of the adjacent faces. Not the diagonal squares. Those light beams will illuminate all the squares in the horizontal & vertical rows. The object is to light up all the squares. Once you've played Akari Free, you'll be ready for Akari 3D. I happen to love it! There are 54 levels: 18 with a small cube, 18 with a medium cube and 18 with a gigantic cube. I've solved all of them and now feel a bit sad that there are no other levels to play. 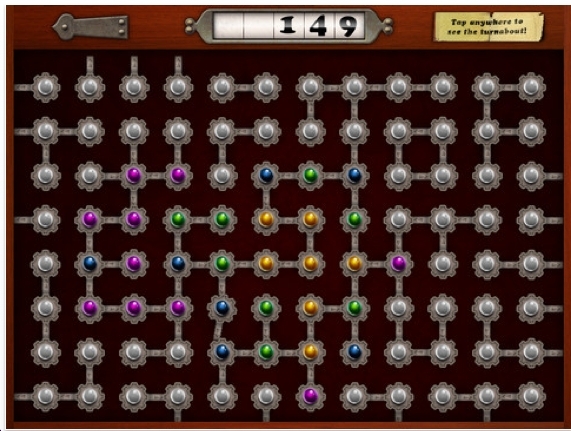 Some of the puzzles have multiple solutions which makes solving a bit trickier sometimes. Sometimes easier. 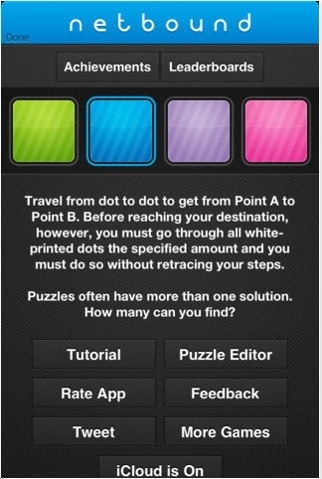 Look for the end of year Best Puzzle Apps of 2012.